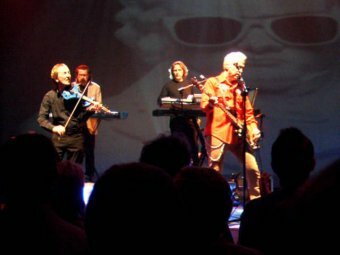 Here is my review of the brilliant, and emotional concert performed by 'The Orchestra' at the Edinburgh Playhouse on Saturday, May 9th 2009. 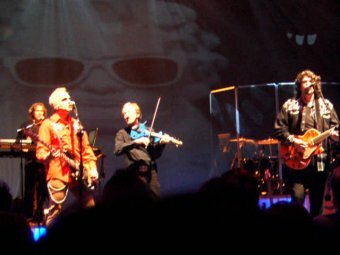 This was the first gig of The Orchestra's Spring 2009 U.K. tour. 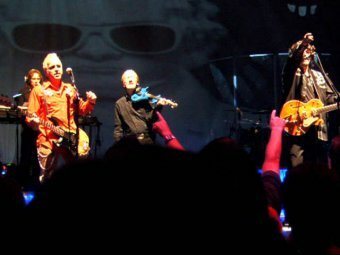 It was also the bands' first gig together since the sad loss of Kelly Groucutt in February. 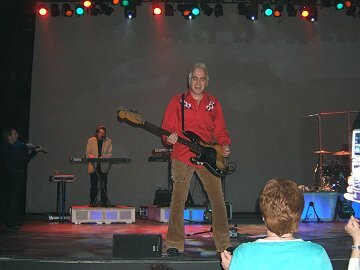 Glen Burtnik has joined the guys for this tour as bassist and vocalist. 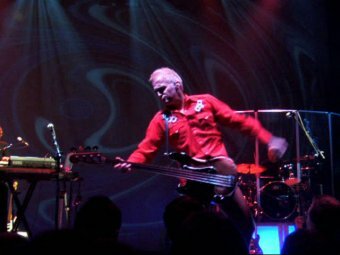 He had performed with the guys back in the late 1990's during some of E.L.O. Part 2's gigs in the U.K. and U.S.A. when Kelly had taken ill. So this was certainly going to be a very 'difficult' and emotional gig for all of the guys, and also a test for Glen having to learn over 30 songs in a very short period of time since agreeing to join the band. 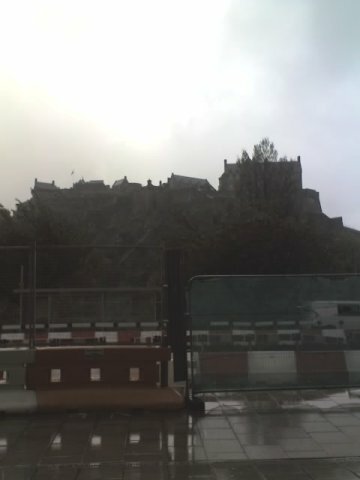 It had been cold, wet and miserable all day in Edinburgh and we got soaked wandering up Princes Street. But as we approached concert time, the clouds cleared and the sun came out. Once in the venue, it was a quick visit to the merchandise stall to see what was on offer this tour. It was a nice surprise to find it so well stocked with a selection of t-shirts, including a special 'In Memory Of Kelly Groucutt' t-shirt and a new World Tour programme with some beautiful photos of the band and special tributes to the late Kelly. There were also various cd's including The Orchestra's 'No Rewind' and new 'live' collection, a Glen Burtnik compilation cd 'Album', and Kelly Groucutt's re-pressing of his 'Kelly' cd. After a quick drink in the Circle Bar, we headed down to the stalls and took our seats, fifth row back and fairly central. As we neared start time, it was obvious that this was going to be close to a full house. The Playhouse has around 3000 seats, and I estimate there were close to 2500 in there. 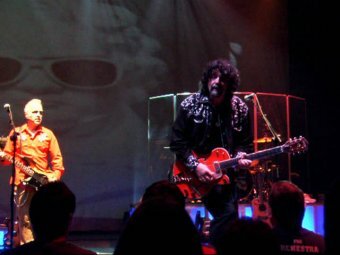 The lights dimmed and the intro music started as the band came out of the shadows to take their places on stage. The crowd cheered as the band started off with 'Twilight'. New bassist Glen Burtnik taking centre stage wearing a black suit. Next up 'All Over The World', followed by 'Rock & Roll Is King'. Next up was 'Wild West Hero', which Phil introduced saying the song always reminded him of Kelly. 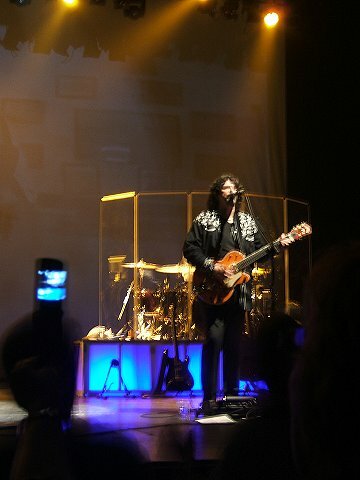 'Confusion' followed and then 'Showdown' featuring the customary stunning guitar solo by Phil Bates. 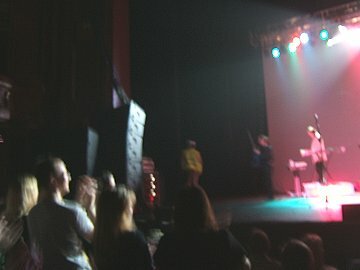 'Sweet Talking Woman' was next which received a very loud cheer from the crowd as many were up on their feet singing and dancing. This was followed by two songs from the album 'Discovery', these being 'Last Train To London' and 'Shine A Little Love' and it was obvious the crowd was in a party mood with Eric & Phil exchanging smiles at the great crowd reaction to the songs so far, and it certainly seemed to have settled whatever nerves the guys had prior to the show. 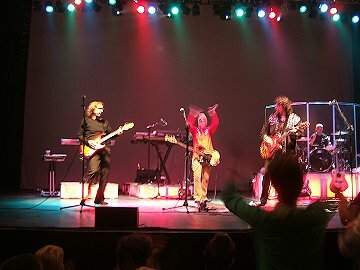 The lights then dimmed as Eric Troyer and Glen Burtnik (now dressed more casualy in red shirt) returned onto the stage. Eric then chatted about Kelly before talking about Glen's musical history. They then performed 'Sometimes Love Just Ain't Enough' which was a huge U.S. hit for Glen and is available on his cd 'Album' which was on sale at the merchandise stall. 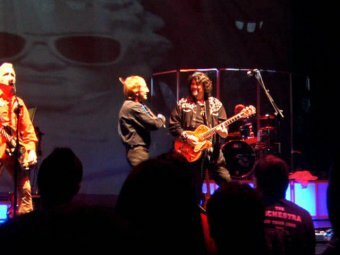 Phil and Gordon then came onto stage as Gordon chatted about their love of The Beatles and introduced another new song to the show 'If I Need Someone', one of my favourite George Harrison-penned songs and superbly performed by Phil, Glen, Gordon and Eric. As Mik and Lou came back onto stage, Phil chatted about the next song dating back to when Mik and Kelly, prior to E.L.O. Part 2 and after E.L.O. 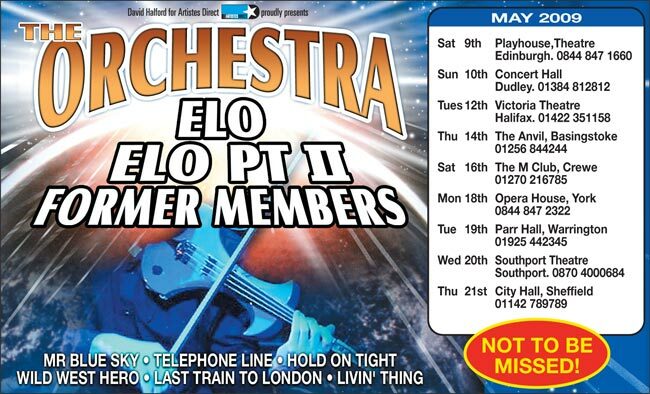 had a band called The Orchestra, no Orkestra and for this tour they had decided to perform the huge European hit 'Fly Away' as a tribute to Kelly. 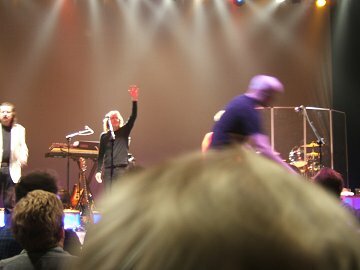 As the band played the song, on the screen behind the band many images of Kelly at home, on stage and with fans were shown. This has always been one of my personal favourite songs and there were certainly a few tears shed by myself & Sue during this song. Watching the images on the screen just brought home that we would never see this unique man again, but his legacy lives on in his songs, videos and our memories. Phew after that 'emotional' song, Phil came to the front to announce the next song 'back by popular demand by the fans'. The man with the blue violin Mik Kaminski then played his hit song from his Violinski days, 'Clog Dance'. I think the whole audience were now on their feet clapping along to this one. Brilliant!! 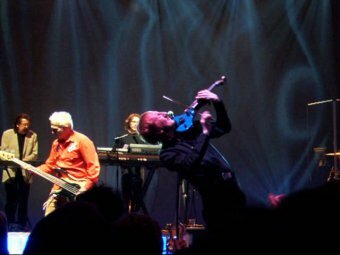 Now with all band members back on stage, Mik continues with his violin solo which then blends into Eric's unique re-working of 'Twist And Shout'. Again the audience up on their feet throughout. More of the classic E.L.O. songs folllowed next with everybody up dancing and clapping along to 'Ma Ma Ma Belle' and 'Evil Woman'. Glen was visibly more relaxed now and coming right up to the front of the stage. 'Telephone Line' slowed things down for a moment before the crowd were up and dancing again to 'Hold On Tight'. 'Standing In The Rain' was performed brilliantly again (and I have to say it is the first time I have witnessed a crowd actually dancing and clapping along to this particular E.L.O. track), followed by the classic 'Mr Blue Sky' which received rapturous applause. 'Turn To Stone' was next up, followed by a rousing 'Do Ya' as the band took their bows. 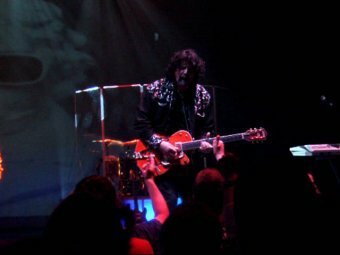 The audience remained standing and cheering until the band returned with 'Don't Bring Me Down' with what I am certain was Kelly's voice shouting 'I Can't Hear You'!!!! Lots of audience participation with this song but this was NOT the last song, as tonight we saw the return of 'Roll Over Beethoven' which received rapturous applause. 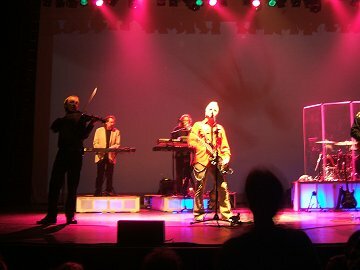 And then that was it, another fantastic Orchestra concert over, and it was plainly obvious from their smiles that the band had enjoyed the gig, all of the guys coming down to the front of the stage to shake hands and applaud the crowd!! What a fantastic show by the guys in what must have been very difficult and emotional circumstances. But once they realised the audience was singing and dancing along almost from the start they seemed to relax and put on a great performance. 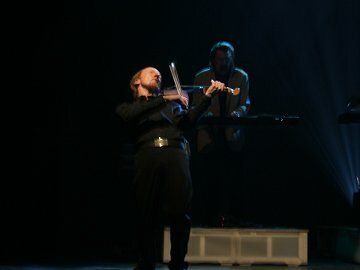 I really enjoyed the new songs at the start of the second part of the show with the welcome return of Violinski's 'Clog Dance'. 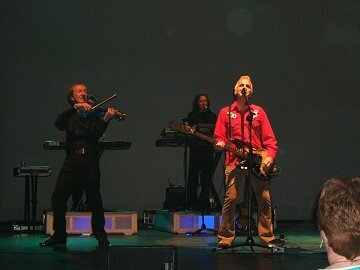 It was also interesting to hear Glen Burtnik's hit song and I must say what a wonderful addition to the band he is. Hopefully he will become a permanent member of the band after this tour. 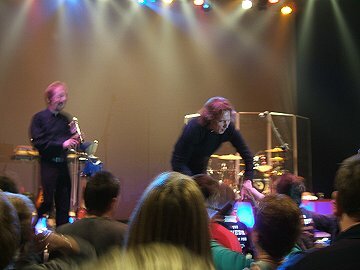 After a nervous first half of the show for Glen, and all the band for that matter, he came out after the break looking more relaxed and enjoying the atmosphere generated by the audience. Hopefully the rest of the tour is just as good as this gig!! As a side note, I am not sure what was going on with the stage crew as one was dressed as the sugar plum fairy and another wearing nothing but a yellow jacket, safety helmet and some very flimsy underwear (see photo above)!!! After a quick chat with Serena & Gill on the merchandise stall, we headed back off to the car for the 100 mile trip back home to Carlisle, arriving back home just after 12:30.